I begin EVERY presentation like this. Yes, it's strong, but with divorce running free, allowing the children to learn things at an inappropriate age, the video games the kids play today and the terrorism they've been introduced to, it is not more than they can handle. From this point on, though, the presentation is much more positive and lighter mood, petting dogs and presenting various ways to make sure that the students understand that they need to learn how to make the responsible decisions: the pets you have in your care remain in your care and receive all that they need - not just given what you think they should have . A huge difference. WHY? Because of decisions your parents have made. Now, if you think that killing these dogs and cats every day of the year is wrong and you want to learn just how easy it is to put a stop to this nonsense, then you MUST pay attention and listen closely for the next 45 min and you can walk away from this presentation with the pride that you are more informed and compassionate than many of your parents. Let's just assume for a moment that you are sitting with your pet at your side. Look around at the room you are in. You and your pet have plenty of room, right? OK. Now, lets assume that your pet has NOT been altered and has a littler of 7 babies. There is still plenty of space in your room for you and your pet and the 7 babies, isn't there? Likely enough food for everyone to be well fed, also. And aren't the little babies cute!!! Now, 6 months down the road, all 7 of the babies are grown and THEY all have litters of 7 babies and your original pet is still not spayed or neutered so she also has another litter. Now, right there in that very room you are in, you have 49 babies, plus 8 adults and yourself. Getting a little crowded isn't it. Not to mention finding food for all of your little friends now, too. Don''t forget cleaning up all their little messes, too. OK, now in just one year from now, you can expect this to happen AGAIN. But this tine you have 49 litters of 7 babies each. That is 343 little babies to share your room with and find enough food for. But wait. That is not all. the 8 adults have all had ONE MORE LITTER OF 7 babies, too. This adds 56 babies to the 343 = 399 pets you have to feed and shelter and all in the room you are sitting in. And this is just one year from now. 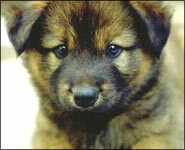 In just seven years, one unsprayed and unuttered dog or cat can be responsible for 50,000 - 60,000 offspring or babies. There isn't' enough room in your room for that, now is there. You couldn't even handle that many in your whole house or in all of your neighborhood. You must realize that this is what is happening all around the world today with our pets. We just have way too many of them and not nearly enough good homes, nor enough room or food to take care of them. The only responsible thing to do with them is to kill them in a 'humane' or compassionate means - this is a shot that gently puts them to sleep and they just never wake up. However you look at this it is killing them. Healthy, young, loving animals that were only brought into this world in the first place because some adults refuse to have their pets spayed or neutered. Their excuse, which is poor, at best, is that it's just not natural. Do they really believe that? Do they think what we are doing NOW IS NATURAL? Will end up like this. 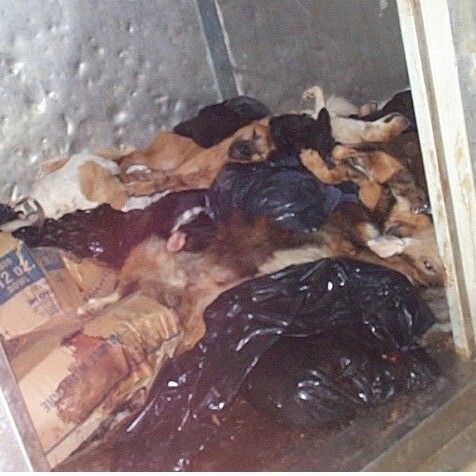 This takes place in every dog pound, animal shelter and humane society in the country every day. It costs a lot of money to do this. It makes the life that was granted us become less compassionate and takes the lives given to these animals and snuffs it out way too soon. If you think for a minute that taking your pet dog or cat to the local dog pound or so called ''Humane Society'' is going to find it another home, IT WILL NOT!!!!! They only have 100 cages. Each day they get 80 new dogs and cats. So, they are forced to kill at least 80 of them each and every day whether they are good, bad, sick, old, aggressive or even puppies. Not enough people go there to adopt. More importantly, if you think you can find 'good' homes for these animals,by placing ads in the paper, that can even bring them more pain and suffering because so many people out there want to sell them to a dog fighting ring (explain what ''bait'' is) or sell them to a research lab so they spend the rest of their lives hooked up to electric wires and get shocked every hour till they die. This is just a perfect lesson of responsibility for young people your age. You do love your pets. Sometimes you don't' want to take the time to walk it or play with it, or clean up the yard after it, but that is part of life. THERE IS ALWAYS going to be something you don't want to do, but you have to do it. So, as much as you may view your pet as being a burden occasionally, just remember that the pet will LOVE and ADORE you every moment of his or her life. It's sad that they don't live as long as we do, but it's pretty clear why. They already know how to give unconditional love. Something that takes us humans 7 times longer to learn. So, if we listen to their voices and try to understand their desires and needs, it will make us better people and add new meaning to the phrase 'Man's Best Friend". YOU CAN STOP THIS UNNECESSARY KILLING!!!!!. All it takes is making a responsible decision to do the right thing. These animals are DYING for you to make the responsible decision. Also, see http://www.21stcenturycares.org/lessonplan.htm for teachers and for a complete selection of topics, discussions, project suggestions and more for humane education clubs, classrooms and efforts.